to move to the country, away of the big cities, and live from the land. The first step they took was to go on a road trip through central Brazil. After thousands of kilometers they ended up in Chapada dos Guimarães, Mato Grosso state, near an area where today we have a national park visited by thousands of people every year. They found a small rural community where a few families were living that same dream, and there was a piece of land for sale there… They bought the land, quit the job, and traded the family car for a VW bus. It was quite a change. Life isn’t easy when you must grow what you eat. My parents planted organic vegetables, which we sold in the market in town, and me and my sisters often had to help with the work in the fields and in the house. For us the hardest part was to live without electricity and a TV set! But we discovered another world, nature. Our home was surrounded by forest and wildlife: monkeys, snakes (some quite dangerous), and birds of all kinds. We played in the trees, in the streams, and explored. One day I found a small trap and set it in the veranda of our home with a piece of banana: it was amazing to look at those birds in my hands, and then release them! Birdwatching didn’t exist in Brazil back then: there were no bird books available, no optics for sale. Life went on, and when I was finishing high school (and couldn’t decide what I wanted for my life) I was invited to guide some people to the national park, since I knew the trails well enough to not get lost. I enjoyed it, and kept guiding on the weekends and vacations while still working in the farm with my parents. I soon saved enough to buy a manual camera and a few used lenses, and started my path in to photography. I had the chance to meet some of the most renowned photographers in Brazil, and that gave me an idea of what I wanted for myself: Nature photography was growing inside me like a religion, and I often spent hours and hours in solitude waiting for a shot, chasing the magic moments that I could only find by myself, with my camera. It got to the point that I wasn’t showing my pictures to anyone, a roll of film would wait for months to be developed: Being in the wild with my camera was enough to me. Well, I was hooked then. Soon I went from guiding hikers in Chapada dos Guimarães National Park to nature tours and wildlife safaris in the Pantanal. 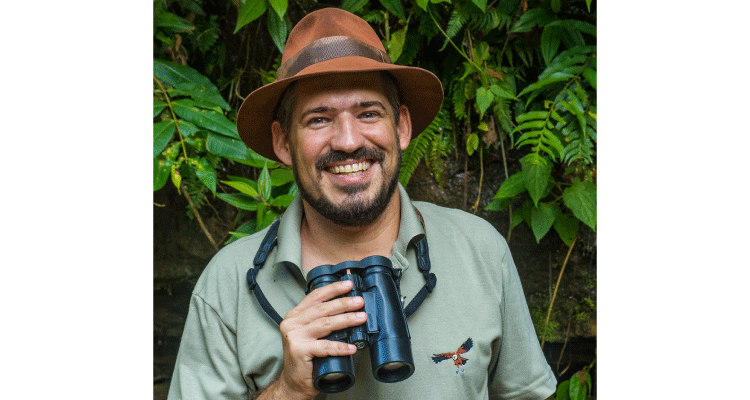 As I developed the knowledge of the birds I started with the birdwatching tours in the Pantanal, Cerrado, Atlantic Forest and the Amazon. Meanwhile Bianca was studying, doing field research and guiding in the Pantanal and in the Amazon. Our company only started in 2011, when I was already married and had the first of our two sons. The freelance job wasn’t enough to pay the bills anymore, so we decided to work toguether! I brought my knowledge from many years of guiding through-out Brazil, and my wife turned her experience as a lawyer in to the flawless operation we have behind every tour at Birding Pantanal. This is who we are. Join us on this adventure!